Are you in the market for a heavy duty sewing machine right now? Do you want a machine that has a sturdy frame and high quality features, but without an incredibly huge price tag? 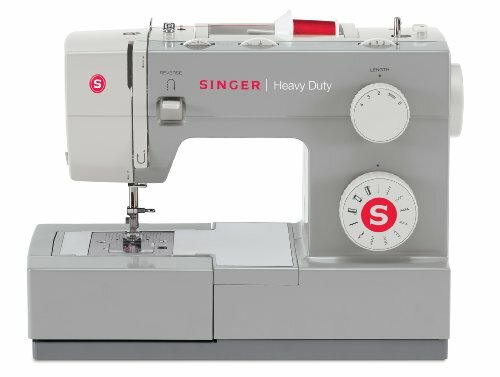 This Singer Heavy Duty sewing machine will offer you up to 1,100 stitches per minute for a price that is less than $250. If you shop on Amazon for it, you can save up to 50% off more! In return, you’ll receive a sewing machine with an interior metal frame that is heavier than you might think so there’s no stitch skipping when using it. What Are the Key Features of This Singer Sewing Machine? Even though it is a high speed sewing machine, it still offers you a full set of the 11 most common stitches that are needed. Pre-programmed into the machine, you’ll be able to get your stretch stitches, some decorative stitches, and even be able to buttonhole if you need to make a quick garment repair with this machine. It’s versatile, fast, but still provides a dependable result with every use. there’s a 25 year limited warranty backing up this product that includes a 2 year electrical and 90 day labor warranty for commercial and residential purposes. Best of all, the free motion sewing that this machine allows gives you the chance to do some creative topstitching for those blankets, quilts, or comforters that you love to make. With accessory storage in the free arm and adjustable presser foot pressure, you’ll get all of the features you’d expect to see with a high quality sewing machine in this cost-effective beauty! What Advantages Does This Singer Sewing Machine Have? It’s the strength of the motor that Singer has included in this high speed sewing machine that really allows it to stand apart from the competition. It’s 60% stronger than the standard sewing machine at this price point, yet it is flexible enough to let you stitch a cuff or a collar with ease. The stitches can be set to a 5 millimeter width as well so that you can create bold looks with ease. There are even three needle positions that let you take care of zippers or cording! You’ll need to pay attention to the length of time you use this machine with prolonged stitching. It can get pretty warm very quickly and that can affect the thread tension. The outer shell is made from plastic and the extra heat can make it warp a bit as well, which then destabilizes the machine and makes the high speed stitching much more difficult to do. If you want a high speed sewing machine for an affordable price, then this could be the best sewing machine for you. It’s got the standard features you want, the ease of use you need, and it’s all so you get the results that everyone will love.